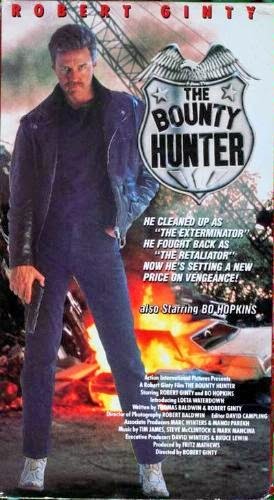 We’re huge Robert Ginty fans, and The Bounty Hunter is a prime example of what Ginty can do when unleashed. This movie only increases his already-large status in our eyes - as star, director, and co-writer, he really gets a chance to shine here, and he indeed seizes the opportunity. Looking a lot like Renegades-era Kiefer Sutherland, Duke Evans (great name) is angry, surly, and the awesome level rises by the minute. This guy truly doesn’t take any guff - would you want it any other way? While his hair and ‘stache are in fine form in front of the camera, Ginty also displays talent behind it as well. There are some really interesting directorial touches; perhaps he felt he needed to prove himself in that department. We think he was successful. While this is the Ginty you want - he pretty much took his character John Dee from the previous year’s Out On Bail (1989) and ran with it - the great Bo Hopkins gives him a run for his money as the baddie. This is classic, quality Hopkins. Yes, he’s playing yet another small-town sheriff (he even makes a Walking Tall reference at one point), but we’ve never seen Hopkins so animated. What he does in this movie is always interesting and worth watching. Maybe it was the fact that a fellow actor was directing him, but Hopkins seems to have been given free rein, with great results. The Bounty Hunter is not silly like a lot of other AIP movies. It has its own feel, and is well worth checking out. The Steve McClintock songs only reinforce the solid merits and virtues of the film. However, marring the otherwise-fine experience is an unsatisfying ending. That’s really the only blot on this effort, but it’s a pretty big blot. But that aside, it’s Ginty and Hopkins at their finest.